Protesters hold letters reading "NO THAAD" during a rally to oppose a plan to deploy an advanced U.S. missile defense system called Terminal High-Altitude Area Defense, or THAAD, near U.S. Embassy in Seoul, South Korea, April 26, 2017. Leading South Korean presidential contenders have criticized the rushed deployment of the U.S. THAAD anti-missile system less than two weeks before their country’s election. Early Wednesday morning, a military convoy of 20 trucks and trailers transported components for the Terminal High Altitude Area Defense (THAAD) missile defense battery to the designated deployment site on a Lotte-owned golf course in the rural southeastern county of Seongju. Included were key elements needed to make the THAAD system operational: road-mobile launchers, interceptor missiles equipped with precise infrared seeking technology, and a powerful radar system to target enemy missiles. On Thursday the South Korean defense ministry said THAAD is being deployed ahead of schedule to meet the increased North Korea nuclear and ballistic missile threat. “Based on the common understanding between South Korea and the U.S., and on the grave security situation on the Korean peninsula, the need for the immediate operation capability of the THAAD system was accelerated,” said Moon Sang-kyun, the Defense Ministry spokesman. But the surprise overnight operation came before construction and environmental inspections at the site have been completed, and just before the May 9 presidential election in which THAAD has become a divisive campaign issue. The early South Korean election was brought on by the impeachment of the former President Park Geun-hye for her alleged involvement in a multimillion-dollar corruption scandal. Park is currently in prison and has been indicted on multiple criminal charges, including bribery, for her role in the scandal. Moon Jae-in, the leading presidential candidate with the liberal leaning Democratic Party of Korea, criticized the sudden THAAD deployment. Moon has said he wants to postpone deploying the U.S. advance anti-missile system until the new president takes office and can evaluate its benefits and drawbacks. “The delivery should be halted even how, and the next administration should ultimately decide this issue,” Moon’s campaign manger Park Kwang-on said Wednesday. Ahn Cheol-soo with the People’s Party, the second leading candidate who is a supporter of the THAAD system, also decried the accelerated deployment by the U.S. and South Korean military forces as an attempt to bypass legal and democratic constraints. South Korean presidential election candidates (from left) Yoo Seung-min of the Bareun Party, Ahn Cheol-soo of the People's Party, Hong Joon-pyo of the Liberty Korea Party, Moon Jae-in of the Democratic Party of Korea and Sim Sang-jung of the Justice Party, pose before a televised debate in Seoul Sunday, April 23, 2017. Protesters Wednesday tried to block the military convoy from entering the deployment site. Many residents living nearby worry about possible negative health and environmental effects, despite reassurances from government officials that the powerful radar system poses no danger. Local opponents are also concerned the THAAD deployment nearby makes this rural region a likely target for a possible North Korean missile strike. 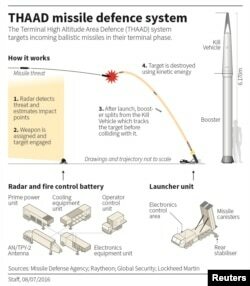 Nationally, opponents argue THAAD is ineffective against the North’s short-range missile and massive artillery arsenal that could target half of the nation’s population of 50 million living in Seoul and other regions close to the inter-Korean border. The negligible defensive benefit, they say, is not worth the risk of provoking North Korea and alienating China. Beijing opposes THAAD as an unnecessary military escalation and voiced concern that the system’s radar could be used to spy on them and other countries as well. China has reportedly imposed informal economic sanctions against South Korea by limiting tourism, imports of Korean cosmetics, and cancelling K-pop concerts and shutting down a number of South Korean department stores in China. 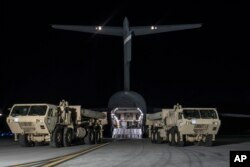 The United States and South Korea agreed last year to deploy THAAD to counter the threat of missile launches by North Korea. They say it is solely aimed at defending against North Korea. The acting government continues to fully support THAAD, but following the impeachment scandal of the conservative Park, public support has dropped dramatically for the party she once led, now called the Liberty Korea Party. Conservatives have tried to make unbridled support for THAAD and the U.S. alliance a key campaign issue and have been critical of the two frontrunners’ support for unconditional engagement and dialogue with the Kim Jong Un government. However, Liberty Korea Party candidate Hong Joon-pyo is currently at 9 percent in a recent public opinion poll. Moon, the Democratic Party nominee is at 41 percent, while his closet rival Ahn with the People’s party has stalled at 30 percent.